The idea of this Shaiva Hub is to serve as a link/hub for getting to know the religious/ spiritual activities that are happening in the various localities. This would help the new comers to the locality as well as the people who were not aware of such spritual services happening next door, to join the groups. Staying in the company of devotees is a great thing even the saints plead the God for ! (aDiyAr naDuvuRRirukkum aruLaip purivAy). This hub shares only the information about the regular activities. (For one off activities please visit the Events calender at Events Calender.) While this hub shares information on the availability of activities in the neighbourhood, it in no means can claim responsibility for the activities that are happening in the groups. The individual devotees are requested to take the information available here as only leads and could decide to go with the activities where they can serve the Supreme Lord shiva to their satisfaction and to the Supreme's delight. திருவண்ணாமலை திருக்கார்த்திகை தீபவிழா அன்னம் பாலிப்புத் திருப்பணிக் குழு - திருவண்ணாமலை சாரிட்டபிள் டிரஸ்ட், கோவில்பட்டி. G. நடராஜன் - 9443245615, 9385995976. திருநெல்வேலி டவுன் திருவுரு மாமலை பன்னிரு திருமுறை வழிபாட்டுக்குழு, எண்.55, வடக்கு ரத வீதி, திருநெல்வேலி டவுன் திருமுறை வழிபாடு, அன்னம் பாலிப்பு, நின்ற திருவாசக வழிபாடு திருமுறை வழிபாடு - - Siva .Murugesan Ph: +91 - 9486176411. நெய்வேலி பன்னிரு திருமுறை வளர்ச்சிக் கழகம், சிவபுரம், கடலூர் மாவட்டம் திருமுறை வகுப்பு, திருக்கோவில் பராமரிப்பு, திருமுறை சார்ந்த வளர்ச்சிப் பணிகள். Service - - Siva. Paramasekar - Ph: 9443482023 Founded year : 1986. 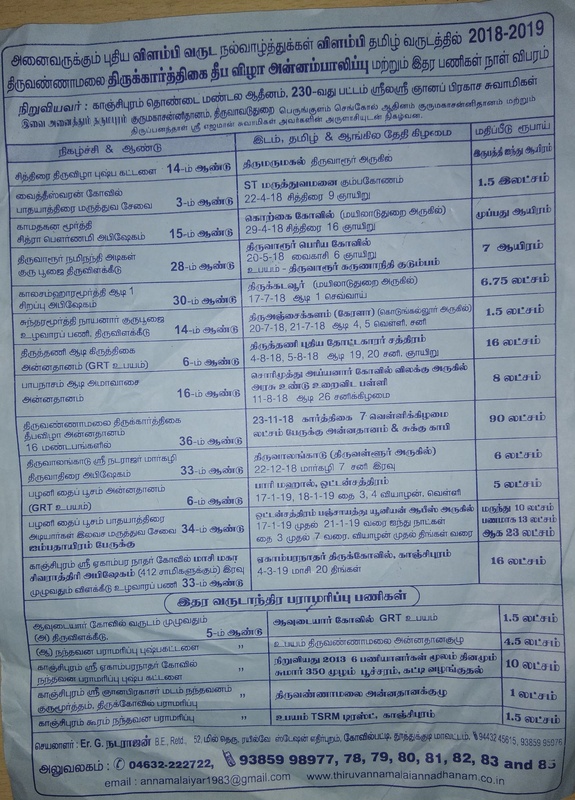 58th Ilaiyapattam, Koonampatti Kalyanapuri Aadhinam. Sri Alangaravalli Ambal Samedha Sri Kruthivaseswarar Iraipani Manram, Soolamangalam, Papanasam Tk., Thanjavur Dt. 614206. Periya puranam books would be given at the venue. New No.1, 4th St., Anthony Nicholas St., Ashok Nagar, Bangalore-25. To Contact siva. A.P. Saravanan, 9449048586. Every month there would be Uzhavarappani done at various shiva temples in South India. Please send your comments .